They think it’s all over …… not yet it’s not! As the final seconds of extra time in the 1966 World Cup Final ticked away, and Geoff Hurst ran towards the West German goal, Kenneth Wolstenholme uttered the immortal line, “Some people are on the pitch …. They think it’s all over …. It is now”. The final three words came as Geoff’s left footed blast hit the back of the net, and England were the world champions, defeating the Germans 4-2, and sparking wild celebrations on the pitch, at the ground, and throughout England. 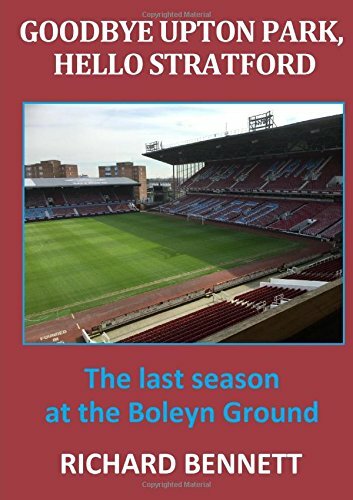 As the final whistle blew last Saturday, you could have been excused for thinking that West Ham had just won a major trophy. The relief on the faces of the players, the manager, and the fans was palpable. It was a very important victory, and potentially a season-defining one, achieved in front of a magnificent atmosphere in the stadium. It opened up a gap of 8 points above the relegation zone third team, who are Swansea themselves. Defeat would have reduced this to being just three points ahead of Hull, who would have been in the final relegation slot with a Swansea win. Eight points is a lot to make up with just six games of the season to go, but not an impossible one. A quick look at the fixture list reveals that the teams below us all have winnable games left, and at the time it seemed that Palace, like ourselves, had potentially the toughest fixtures on paper in the games still to be played. But that was blown out of the water to an extent with the comprehensive Eagles 3-0 win over a stuttering Arsenal team. Stuttering that is, except for when they played us! On the other hand, our optimistic fans are looking upwards, and our tally of 36 points in 14th position is just one point shy of Watford, who are in 9th place just one point above us. So a top-half finish is very much within our grasp with a good run before the end of the campaign, hopefully beginning with a victory at Sunderland this weekend, who themselves look pretty much doomed, and trail a safety position by 10 points. I believe a win in this game, whilst not making us mathematically safe yet, would just about ensure that next season we are again in the Premier League. But these are the types of games where we can come unstuck. And if that is the case, and if the results of the teams below us are positive ones, then there will still be plenty to play for. There is a mythical figure of 40 points that all teams strive to achieve as soon as possible every season, believing that they will be safe, but this is not always the case, as we found out to our cost in 2002-2003 under Glenn Roeder. This season it will probably be OK though, as it is doubtful that both Swansea will achieve 12 points, and Hull 10 points, in their six remaining games. But both have at least four “winnable” fixtures left, and the fat lady is not singing yet, although she is probably going through her vocal exercises in preparation. A win over the Mackems will leave us just one shy of the mythical 40, and with a significantly superior goal difference (at the moment!) over Hull and Swansea, 39 could turn out to be the important figure. Of course, we may have enough points in the bag already. Many fans around me were saying that, after the win over the Swans, that is it, we are now safe. I read today (I don’t know how true it is) that Messrs. Sullivan and Gold are now looking for potential wealthy investors to buy into the club, to take us to the next level, believing that Premier League football is secure now. It probably is, but with West Ham you can never be sure. Our current “safe” position is not irreversible, and there are still balls to be kicked before the season’s end. So to those of you who think that it is all over, I urge a note of caution, not yet it’s not! But hopefully, it soon will be, and with a few wins in the remaining games we can end up in the top half of the table, a position that didn’t look likely earlier in the season.